Main features are: COLUMN: Jonny Smith. FIRST DRIVE: Toyota C-HR Hybrid. 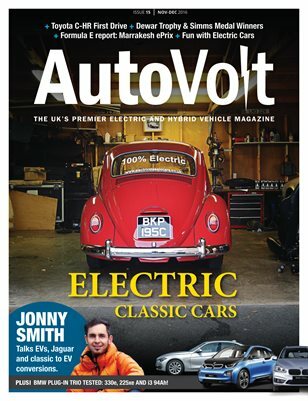 FEATURE: Electric Classic Cars. REVIEW: BMW 330e. REVIEW: BMW 225xe. REVIEW: BMW i3 94Ah. INSIGHT: What happens when you run out of juice in an EV? FEATURE: EVs are fun…? FORMULA E: Marrakesh ePrix. TECHNOLOGY: Dewar & Simms Awards. BUYING GUIDE: Tesla Roadster.